With the long-awaited reissue of the Autavia topping the news out of TAG Heuer this year, there was yet another update to one of their reliable mainstays – the Aquaracer. While it’s not unusual for a brand to make changes to a model every year or so, the past few years we’ve seen the Aquaracer steadily evolve, with a series of small tweaks and refinements made to the collection. 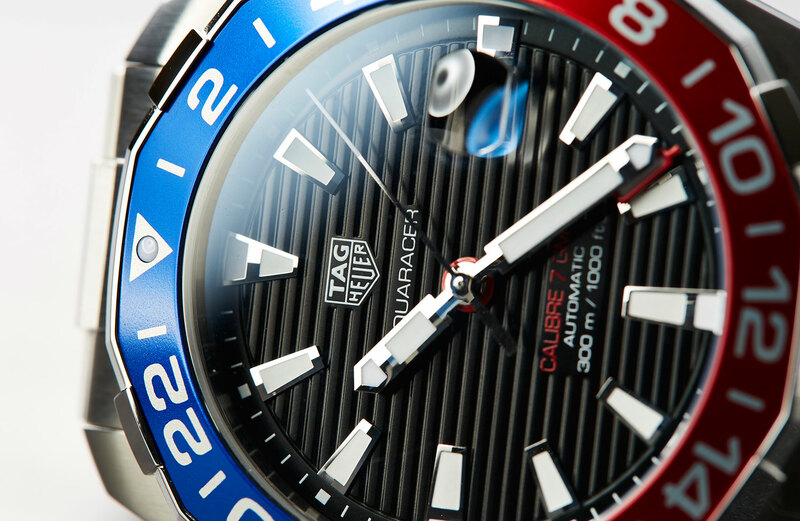 This year, and almost as a culmination of all the changes, TAG Heuer released the brand new Aquaracer Calibre 7 GMT. 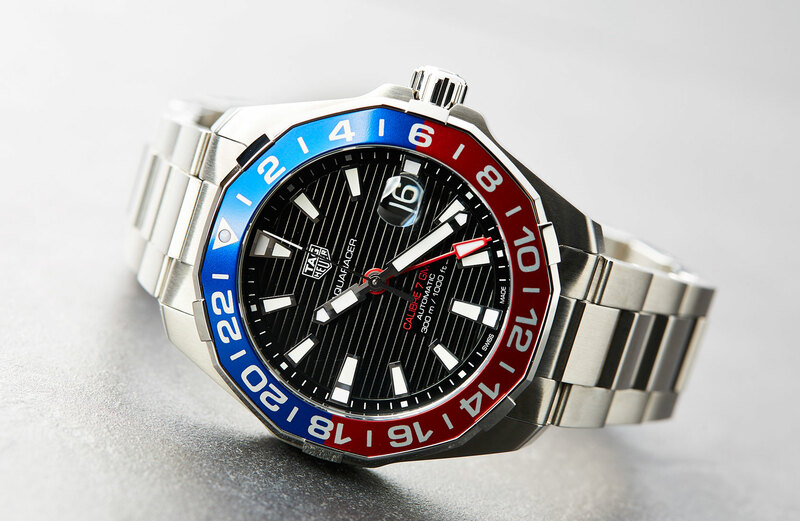 Although it’s not the first Aquaracer with a GMT complication, it is the first to use the combination of blue and red on the bezel. 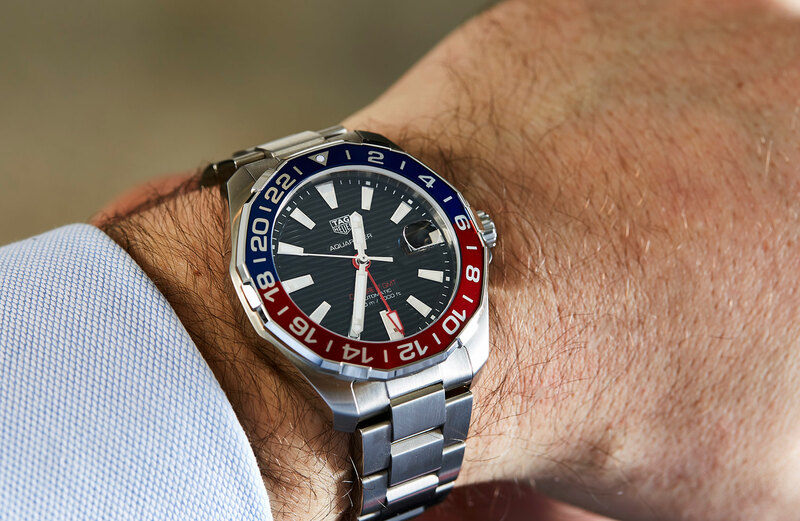 And despite the obvious connections that the ‘Pepsi bezel’ draws, the bicoloured combo sees a happy return to the colour scheme of the Autavia GMTs from the 1960s. However, it’s not just the colour that makes a comeback. 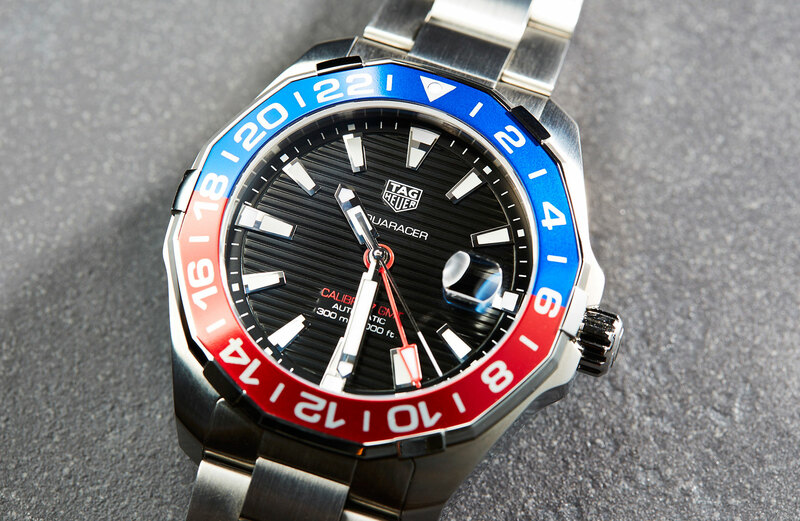 TAG Heuer have done away with the ceramic bezel of recent Aquaracers, and returned to an aluminium construction that intensifies the colours instead of the price tag. Even with the added complication, the Calibre 7 GMT comes in at only $100 more than a regular Calibre 5 with a ceramic bezel. Not a bad trade-off. 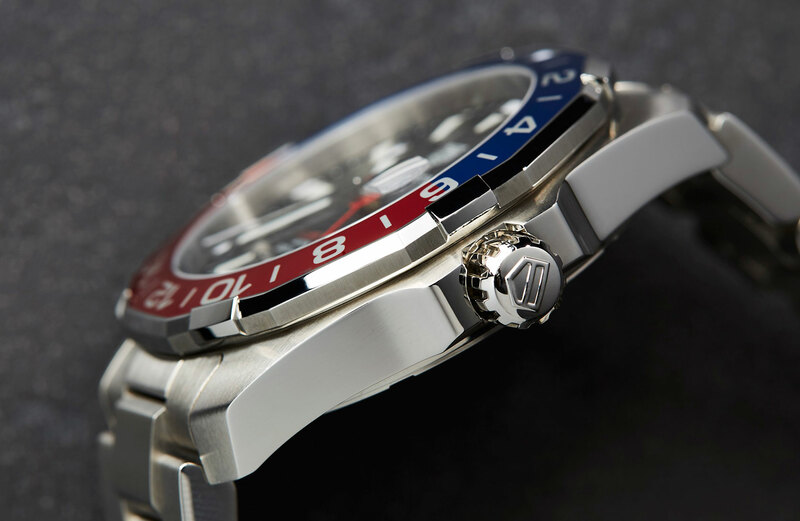 The bezel is bi-directional and uses a classic 24-hour scale. Pairing with an independently adjustable red GMT hand on the dial and making it super easy to adjust and track that second time zone as your plane touches down. 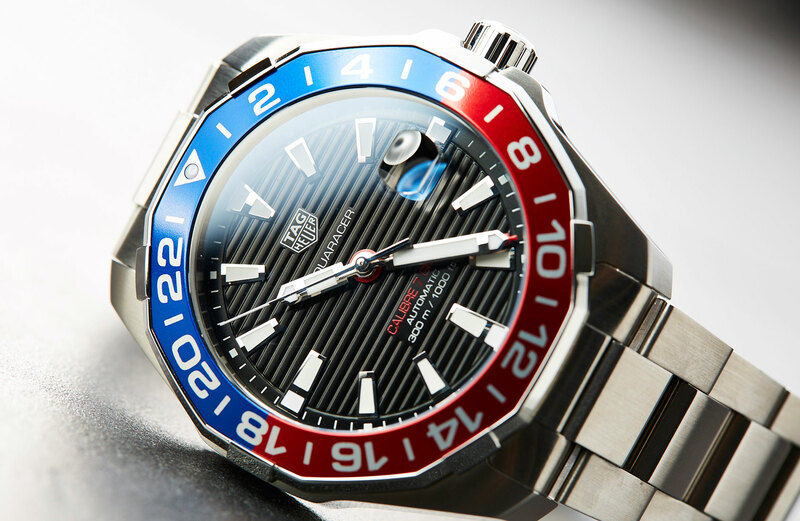 Last year we saw the 300m Aquaracer upsized to 43mm, and this new GMT is no different. Currently only available on a stainless-steel bracelet, the neatly finished case is a mixture of polished and brushed surfaces, with its stretched macho lines giving it a distinctly solid feel on the wrist. Also worth mentioning is the Calibre 7 movement, which depending on its execution, will either be an ETA 2893-2 or Sellita SW330-1 equivalent. Either way, it’s a solid, reliable engine, with a beat rate of 28,800 and a power reserve of 42 to 46 hours. For all the self-confessed lume freaks out there, the Calibre 7 GMT will not disappoint. Its faceted hands and hour markers use a combination of blue and green glowing SuperLuminova. With even the white tip of the second hand coated in lume to shine some light into the darkness. Something we’ve seen on previous versions of the Aquaracer, but nonetheless still very cool. Not much else is different on the black opaline dial either. A white printed logo and text is highlighted by a single top line of red, and across the dial, familiar horizontal recessed streaks add character and depth to an easy-to-read layout. And then there’s the magnified date, an ever-polarising feature. Personally, I prefer the cleaner look of a cyclops-less crystal, but your mileage may vary. When it comes to watches, affordability is exceptionally relative. But this latest colourfully attractive addition to the Aquaracer family brings another useful complication to within reach of the everyday man.